The new Dacia Logan MCV Stepway Estate might be priced at just under £11,500, but it’s a smart family car that’s tough, practical and surprisingly well-kitted out. If its rivals are a little bit out of your price range, it represents a viable alternative. It’s the more robust version of the standard Logan model, but it’s not all plain sailing. It won’t surprise buyers in the least that its interior is as basic as basic does, while the lack of four-wheel-drive puts a serious dent in its off-road credentials. OSV takes a closer look at what it’s all about in our 2018 Dacia Logan MCV Stepway Estate review. If the way the Logan MCV Stepway Estate drives is as good as things get for a large car at this price point, few people will be complaining. It’s no show pony, has zero tricks up its sleeve, but it gets the job done and is easy to drive. It’s never a driver’s car, but that was never the point. Moreover, we hardly think that anyone checking out a Dacia is expecting it to be dynamic. It has a few pluses. Its soft suspension ensures good ride quality, and it does a mostly consistent job of ironing out lumps and bumps. Britain’s worst roads will still present an issue, however. The raised ride height has benefits: it provides good visibility and further improves comfort. On the whole, if you take it easy with the Dacia and don’t try to push it too hard, we reckon you’ll get along with it just fine and dandy. It’s laid-back and – for such a big car – far from intimidating. In term of its engines, there’s only one petrol available. This is a turbocharged three-cylinder 0.9-litre unit that takes 11.1 seconds to complete the 0-62 dash. It’s not an easy engine to recommend because it struggles with a fully-loaded Logan and isn’t as economical as the diesel. Provided your expectations are low, we can’t see too many buyers complaining with the Logan MCV Stepway’s interior. It’s basic and simple, but at the same time it’s hassle-free and easy to live with. 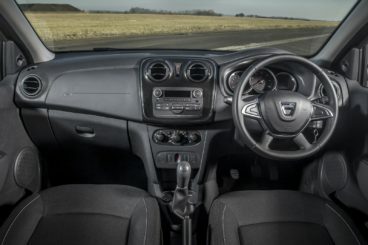 It also benefits from a recent facelift and now comes with some better materials, as well as a brand new steering wheel. And, really, can you ask for much more than that? The car is super practical, too. In fact, this is its forte (MCV does stand for “maximum capacity vehicle” after all), and it accommodates passengers upfront and in the rear very well. There is a good amount of storage spaces, and the boot measures a very respectable 569-litres. You need to use a key to open the boot and folding the rear seats increases its capacity to 1,518-litres. It’s not the biggest in this class but it’s still an impressive size. Standard kit is good across the range, with the Zetec model now the entry-level model. It comes with a heated windscreen, cruise control, air conditioning, a digital radio and alloys. The Titanium model adds the SYNC3 infotainment system, an 8” touchscreen, automatic lights and wipers and a half-leather trim. The Titanium X model chucks in a foot-operated boot release, leather seats and panoramic sunroof, but as it costs around £2,900 more than the Titanium model, it’s hard to recommend. The Vignale trim rounds things off with Sony speakers, ambient lighting, a power-adjustable driver’s seat and 18” alloys. Safety-wise, we have no worries with the Kuga. It was awarded all five stars by Euro NCAP for its crash test performance and standard safety kit includes a speed limiter, cruise control, a seatbelt warning buzzer, lots of airbags and electronic stability control. Prices for the new car start out from £11,495 and rise to £13,895. For more information on our leasing deals, you can check out our page here. In terms of its running costs, the sole petrol engine is more expensive to run than the diesels. This 0.9-litre engine returns almost 58mpg, which we think is pretty reasonable. Road tax will set you back £140 a year, while the car has a BiK rating of 22%. It’s basically a tougher-looking version of the standard Logan MCV model that gets flared wheel arches, side sills and black plastic bumpers. The car’s raised ride height means visibility is excellent, and it feels like a proper off-roader (even if it isn’t). It boasts a large boot, lots of space, the aforementioned raised ride height, and it’s overall a very useful family car. This might prove to be a deal breaker for some buyers, especially when you consider how many of its rivals come with this option. The standard Logan is cheaper and also very practical for its price. 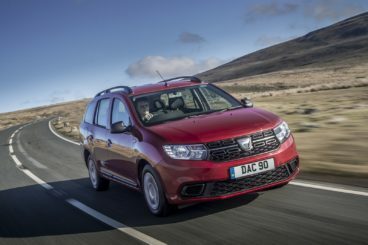 Let’s see how the car fares against its rivals in the comparison section of our 2018 Dacia Logan MCV Stepway Estate review. 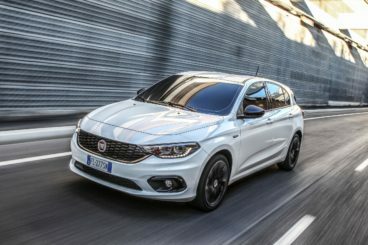 The new Fiat Tipo Estate has been smartened up, and now looks like one of the most assertive and polished cars in this class. Despite its somewhat aggressive front-end, however, this is far from a sporty car. Instead, Fiat have put the onus on making it as comfortable as possible. To this end, they’ve largely succeeded. It won’t excite you and there’s a real lack of Italian flair, but it’s a thoroughly enjoyable car to drive. The steering is communicative, there’s lots of grip, but body lean in bends is a bit of an issue thanks to the soft suspension setup. In terms of its engines, there are three petrols to take your pick from. All come with four cylinders, with a 1.4-litre 94bhp variant kicking things off. It’s paired up with a 6-speed manual gearbox and completes the 0-62 sprint in 12.1 seconds. If that’s too leisurely for you, a 1.6-litre 109bhp engine that completes the same dash in 11.5 seconds might be more to your tastes. Rounding off the range is a turbocharged 1.4-litre 118bhp engine that’s paired up with the 6-speed manual, and which boasts a 0-62 time of 9.6 seconds. That’s mighty quick for a car of this type, and it’s fairly economical too. It returns 46.9mpg, which isn’t far behind the 54mpg economy managed by the 94bhp variant. The 118bhp model emits 139g/km of CO2, while the smaller petrol emits 132g/km. Inside, the Tipo doesn’t deliver on the promises set out by its rather exciting exterior. Inside, there is very little of the design flair we’ve had the pleasure of experiencing from past Fiat’s, with the brand taking a more measured and conservative approach for the new Tipo. What you have is a very business-like interior that’s actually a tad disappointing. Dark upholstery and plastics dominate, with only the higher spec models getting treated to lashings of chrome. Build quality is good but some of the materials seem mismatched. For example, there is evidence of soft-touch plastics but they contrast with harder ones. Visually appealing? Hardly. In terms of how practical the Fiat Tipo is, we have no complaints. If you need as much practicality as possible but don’t have a large budget, it could be a straight face-off between the Dacia and the Tipo. Rear seat space is the best in this class, access is day, and there are 12-litres worth of storage spaces dotted around the place – including a gigantic glovebox. As far as family cars go, this is top class. The boot, meanwhile, measures 440-litres. That’s miles off the Logan MCV Stepway but still very good for this class. The new Skoda Fabia Estate might only be a supermini-based estate but it has enough interior space to make buyers of car’s from a class above jealous. It’s never been what you could call fun to drive, but the Fabia is easy to live with. It leans a lot in bends and the steering isn’t especially sporty, but it’s comfortable even at speeds, although badly bruised roads will present one or two problems. In terms of its engines, the petrols are much quieter than the diesels and will suit most buyers. The 1.0-litre 59bhp unit sits at the bottom of the range, but its modest power output means it’s likely to be overlooked. The 74bhp variant isn’t much faster and it’s got a rhythmic throb that can grate on the old ears, which is why we recommend the 1.0-litre TSI engine. This is a turbocharged unit that develops 108bhp, and which covers the 0-62 dash in an impressive 9.5 seconds. That’s not bad at all for a car of this type. It’s fairly frugal too. Despite all that pace, it can return as much as 64.2mpg economy. All models costs £140 a year to tax, but the Fabia is dirt cheap to insure and occupies groups 2 to 12. Inside, the Fabia sure looks a lot better than last time, and it benefits from being a VW product. There are still some harder plastics here and there and not as many soft touch plastics as we’d like, but it’s a step up from the Dacia. Everything is logically arranged and looks smart, but if you’ve ever stepped inside a Volkswagen Hatchback, you’ll notice a drop in quality here. 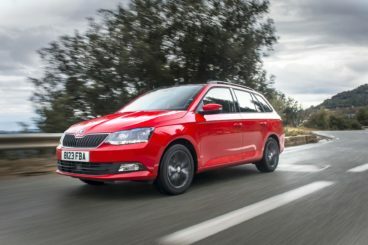 Is the Skoda Fabia Estate practical? It might be a large, large car but it’s got an impressive 530-litre boot. That’s smaller than the Dacia but bigger than most other rivals in this class, and indeed is almost as big as the Ford Mondeo. Fold the rear seats and you can extend it to 1,395-litres. It’s longer than its supermini sibling, which means leg and headroom is better. Even taller adults should be able to get comfortable on longer trips, while storage spaces are literally everywhere. If value for money is what you’re looking for from your next car, this one holds all the aces. The Skoda Fabia Estate has a smarter interior finish, but if that isn’t top of your list of priorities, this offering from Dacia should be a contender. It’s practical, well-built and even has a bit of kerb appeal. The new Dacia Logan MCV Stepway Diesel hardly rolls off the tongue, but it’s never going to let you down either.